"Italy is one of the most beautiful places in the world!" Of course, you may say, you are Italian and obviously you love it, but let’s try to convince you about what an amazing place Italy is!! 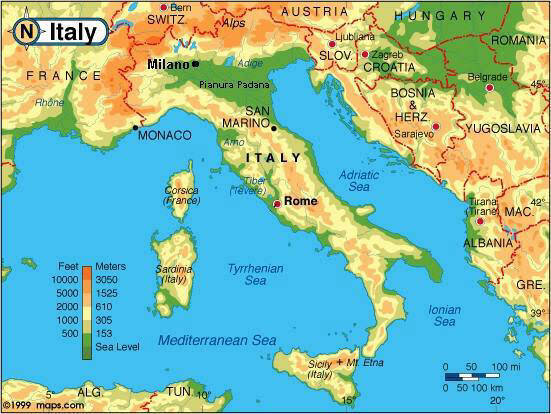 Italy is a small country, covering an area of 294.000 sq. kms (half the size of France or Germany, slightly larger than Arizona) and only a very small part of the country is flat. Actually, the only real “flat” area is around Milano (!!! ), the Pianura Padana, that goes from Torino in the west to Venezia in the east. The distance between these two towns is 350 kilometres and the width of the area is about 150 kilometres from north to south. Yes, the only good thing of Milano is that it is near everything: The Lake Region, Alps, Appennini, ferry to Corsica and Sardinia, Venezia, Cote d'Azur, etc. In other words, if you depart on one of our motorcycle tours from this area, Milano, you can be riding in amazing places in a very short time! You cannot go wrong with any riding destination in Italy! Any back road you take with your motorcycle is a good road for riding. From the Alps, famous world-wide for its natural beauty, to the very far south in Campania and Calabria. Everywhere there are perfect places for motorcycle adventures - no traffic, good roads, good hotels, nice people and, in case you need to be in a city like Palermo, Napoli, Roma or Milano, the highways will take you there in an incredibly short time. Plus, do not forget the islands: Sicilia, Sardinia and Corsica, the last island that is part of France politically, but geographically form part of Italy. TAKE A LOOK AT THE MAP TO GET A BETTER IDEA OF WHAT WE’RE TALKING ABOUT! The weather divides Italy into 2 areas: the Continental and the Peninsular. The first one, the Northern part, has a good climate for riding from May to September, while the second part, stretching from Tuscany to the South, is perfect almost all year round, excluding December, January and February. Actually, Sicily’s weather is already perfect in February most years (minimum temp. around 15/17°C or 60/64°F and max around 20/25°C or 70/80°F). The Alps are perfect in June, July and August. However, by the end of September you may find snow over the high passes like the Stelvio or the Gavia. Appennini, the central Range, is the back bone of the country. It is not as high as the Alps, but more enjoyable and more open, with great roads and large bends stretching from Tuscany to Calabria, to the far south. The area is less well known and, therefore, has fewer tourists. And of course, Italy does not need any introduction to its cuisine and of course for places like Venezia, Firenze, Roma, Napoli, Capri, Ischia, Amalfi !!! Are you still there?! Why not enquire about our unforgettable motorcycle tours? Check the availability of your motorcycle and catch your flight to Italy!